A walk through my favorite fabric-by-the-pound store led me to Insul-Bright fabric, the stuff used in oven mitts and pot holders. It was sold in folded bunches for $3.99/lb. I grabbed two large pieces (I’m not a measurer) hoping it was enough for all the #RV window coverings, and walked out for less than $10.00. It ended up being enough to double layer each window! I cut two pieces of the insulation fabric to fit each window and stapled them together along with sticky backed Velcro circle fasteners. Depending on the size of the window, I stapled Velcro to all four corners and at least two places in between. Then I stuck the other side of the Velcro just inside the window to correspond, and stuck the fabric panel to it. Since these are covered by curtains, I saw no point in sewing or making them pretty. They serve a functional purpose of blocking the sun and heat, however, the Velcro makes them easily removable to see out the window or take them down during mild weather. Next I put some thought into how to hang more traditional curtains. Originally, the camper had mini blinds, curtain rods, curtains, and a cornice over all of that. I’ve always hated mini blinds. They collect dirt and are terrible at blocking light, and need I remind you of the hideous pink flowered fabric? It all had to go. The obvious solution was to hang new curtain rods and curtains. I was concerned that a rod would allow the curtains to hang away from the wall thereby letting in heat and light that made it through the first insulated barrier. Velcro and staples to the rescue again! I cut panels for each window out of heavy, felt-backed fabric (another opportunity for added insulation) and added a decorative fabric across the top. Again, I’m not a measurer, but I can tell you the panels extend about two inches on the sides and bottom of the windows and about four inches across the top. That’s after hemming all four sides. Recreational vehicles are known to have little insulation and thin windows to keep their weight down. Our 1987 Kountry Aire 5th Wheel is no exception, and it heats up fast! 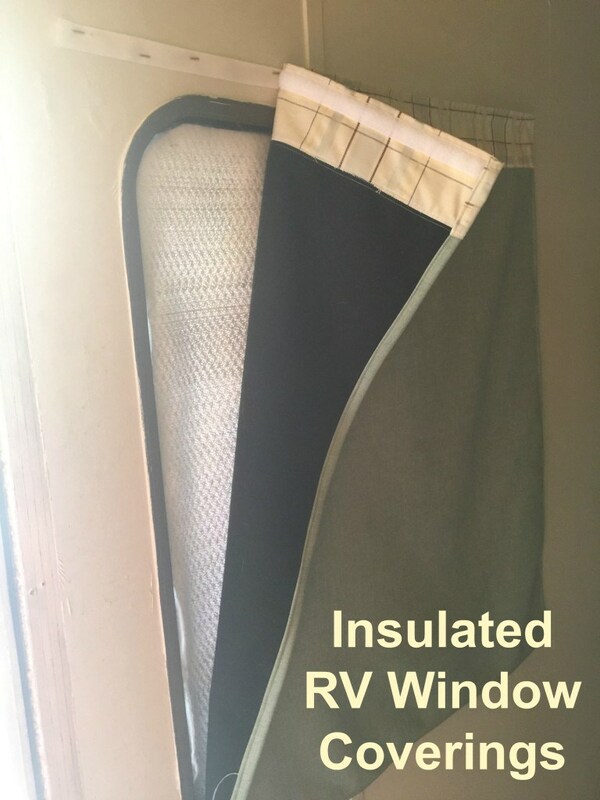 When it became apparent that we would still be parked in the Phoenix, AZ area during the peak of summer, I came up with an RV window coverings solution that was easy, fast, cost effective and not terrible to look at.